Everybody loves the movies. The glitz, the glamour, the shine and the success. So why should Cinerama, a slot machine loosely based on the cinema, be any different? This simple 5 reel progressive jackpot slot operates with five different pay lines, and the objective is no different than any other slot machine on the market. 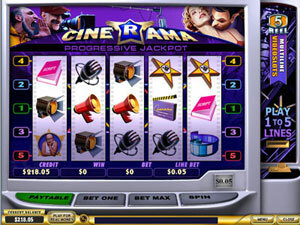 Combine symbols on a pay line to reap the rewards that the Cinerama Slot has to offer. Of course some symbols are worth more than others, and the more of these high paying symbols that you match up, the greater your prize is destined to be. Like most slots, Cinerama has both scatter symbols and a Wild card. In this slot, the snapping board entitled Cinerama accounts for the wild card, which can be used to take the place of any additional symbol you may need to complete a pay line. The director and headphone symbols make up the scatter symbols, which offer a gamer the chance to participate in two additional bonus rounds, something not every slot game on the net can afford. The biggest jackpots are of course reserved for the film camera, and script symbols, each bringing about big pay days should you manage to spin five of them in a row to complete a pay line. The five film cameras however, are the only ones you're really going to need if you want to put your grubby little mitts on that gigantic progressive jackpot, which is often over 10,000 coins. As for the bonus games, the first will see you needing to pick one film out of a selection of four that will go on to become the highest grossing film of the weekend. Of course your prize depends on how well you do, and to activate this bonus game you will need to spin a headphones icon. Spinning three directors symbols will see you enter the second bonus game, this requires you to select an actor and actress to lead your film, should your film turn out to be a flop you'll regret it, but if it is a financial success, you'll be rewarded generously!